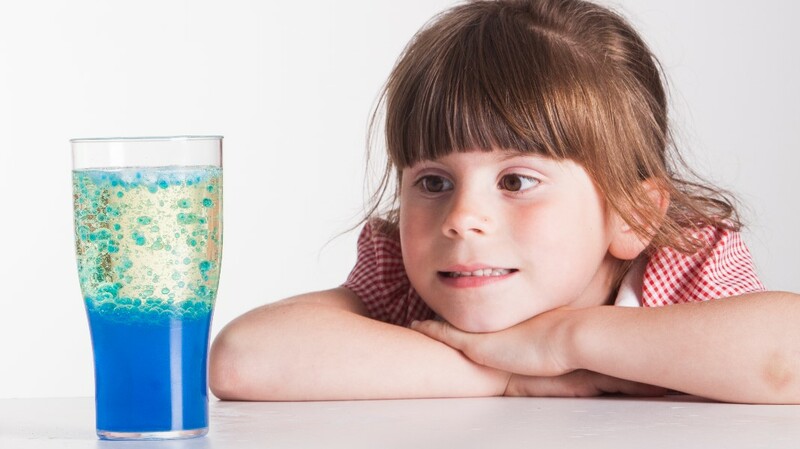 Watch coloured bubbles bobbing up and down with this neat homemade lava lamp. Fill the jar a third full of water. Add about the same amount of oil. Note that the oil floats in the water. Mix the food colouring with a little water and add it. The food colouring colours only the water, not the oil. Break up an effervescent tablet into bits and drop it in. The Alka-Seltzer dissolves in the water producing carbon dioxide gas, which rises to the surface giving a lava lamp effect. It looks wonderful if you shine a torch underneath this in a darkened room.